At 3.6kg, the Tidy Tent Xtra (Camper Cave) isn’t the lightest, but it is huge, at 2m tall x 1.6m long and 80cm deep. Definitely one to get set up and then leave up. It’s durable and waterproof enough to do so, and when it’s not in use, it packs away into its own carry case, for storage in the boot of your car. You can zip two Camper Caves together if you need more space, effectively doubling the depth and the volume inside. The roll-top entry makes putting your stuff away hassle-free (no battling with a door flap) then it simply rolls down and zips closed. Completely rain and windproof, so no need to worry about your belongings getting wet, and it has an inner groundsheet, to keep bags and boxes away from the wet floor. 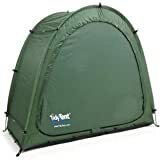 Designed to function just like a regular tent, the Tidy Tent Xtra (Camper Cave)is made from durable polyester, which allows rain and snow to slide right off. 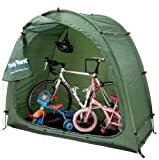 One of the best bike tents we reviewed. Tidy Tent Xtra - Modular Garden Storage Solution.